First Presbyterian Church of Littleton (FPCL) has a youth hand bell choir called the Tintinnabulation Ringers (“TNTs”) that is in its sixth year and is the newest hand bell choir to join the prestigious music program. 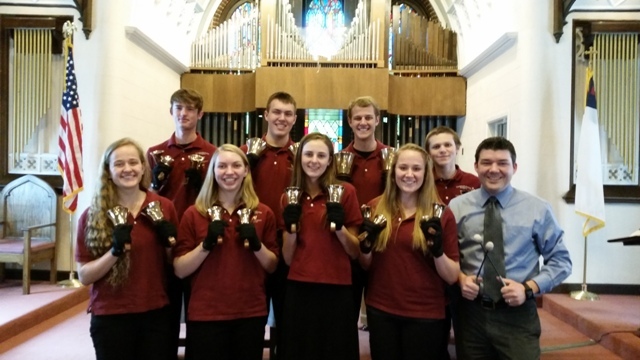 This esteemed group of hand bell ringers is “composed” of Senior High students who are dedicated and committed to their work as a worship-based performance group. Ringing techniques and music reading skills are covered as the TNTs practice together and evolve into a tight-knit Christian music ringing sensation. The Tintinnabulation Ringers meet on selected Sunday mornings prior to a scheduled worship performance, and ring (and occasionally sing!) during church services from September through May. On an annual basis, the hand bell choirs attend both local and national festivals and conferences, and also perform locally for various businesses and events. The Tintinnabulation Ringers attend a conference/festival or camp each summer and have traveled to New Mexico, Minnesota, Utah, and Arizona. Read about TNT’s recent trip to Snow Mountain Ranch. Contact Karen Meersman for more information. After waiting 18 months for the first shipment of hand bells to arrive from the Whitechapel Foundry in London, the First Presbyterian Church of Littleton’s Memorial Hand Bell Choir was organized in the fall of 1962, beginning with 25 bells (two octaves). Our current set of hand bells number 61 (5 octaves) All the hand bells were purchased with funds provided in honor or in memory of individual members of the church. The large C3 hand bell is 11 3/8 inches in diameter and weighs 11 lbs., 1 oz.. The baby hand bell, C8, is 2 inches in diameter and weighs 7 oz. FPCL is fortunate to also own an additional four octaves of Malmark Hand Chimes, purchased for the ringers by very generous members of our congregation. 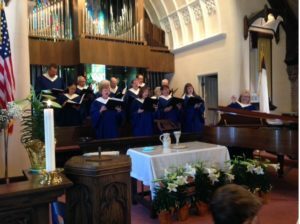 The Memorial Hand Bell Choir plays worship music in church once a month, and rehearses weekly from September through May. 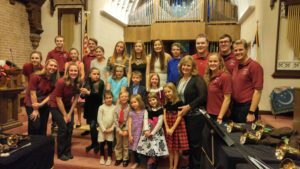 The Memorial Hand Bell Choir also participates in local, area, and national workshops to learn, share, and perform with other hand bell ringers. 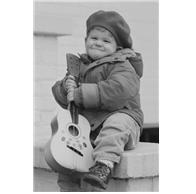 This group always enjoys entertaining for local organizations when the schedule allows. During the Christmas and Easter seasons, the hand bells add to the beauty and festivities of First Presbyterian’s special worship services. Contact Karen Meersman for more information.